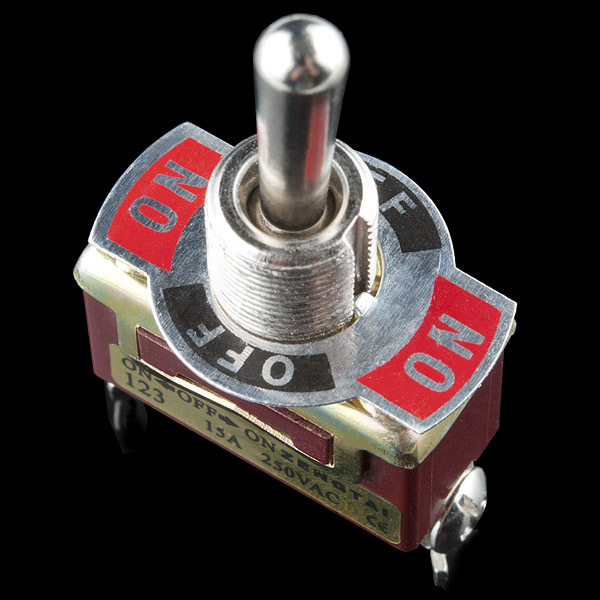 I bought COM-09278, which seems to be the same missile switch cover, only red, and the momentary on-off-on switch pictured above (COM-10545). The concept is that the momentary-on with the guard down will activate a "SAFE" indicator (steady green LED) and then when the guard is lifted, an "ARMED" indicator is activated (flashing red LED). As a preliminary fit check, they fit dimensionally just fine from what I can tell. The ONLY problem, it seems the missile switch cover spring doesn't have enough cajones to close the switch in the guarded position, IF you close it slowly. If you flick the guard to the closed position rather than lowering it slowly (Hey, when you have missiles at the ready, who's going to be gentle with this thing?!) then the inertia of the spring-forced cover has enough to close the switch. The cover will still be effective, IMHO, and for what I'm using it for, if it doesn't activate my "SAFE" indicator, I'll just push it the rest of the way closed, and it does hold. The position which does matter for my use is with the guard lifted, so it does it's job for me. 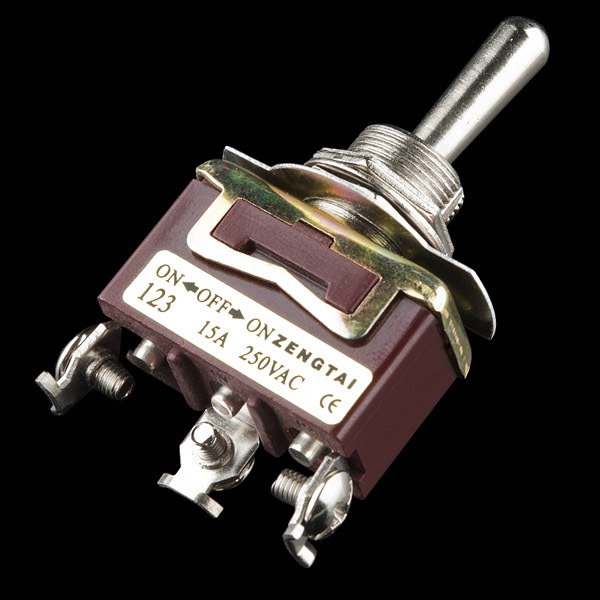 Can these be effectively combined with a switch cover like COM-09278, or does the cover basically force the switch into one of its "on" positions? Heheh, I liked it better when it said "wench controls." Is this switch compatible with https://www.sparkfun.com/products/11146 bat handle condom, to make it water proof? 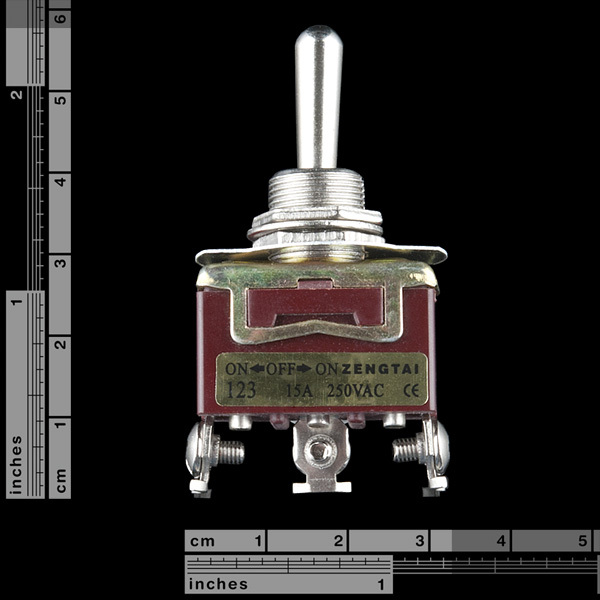 The thread size of this momentary toggle switch is => M12x0.75mm. You could definitely use these as the triggers for the MP3 Trigger board. You would simply need as many switches as tracks that you intend to trigger. useless, but hey, I'm no EE. hi, can this be used as a 2-way joystick? Is it a "make then break" switch? They usually are, to avoid popping sounds when changing pick-ups. 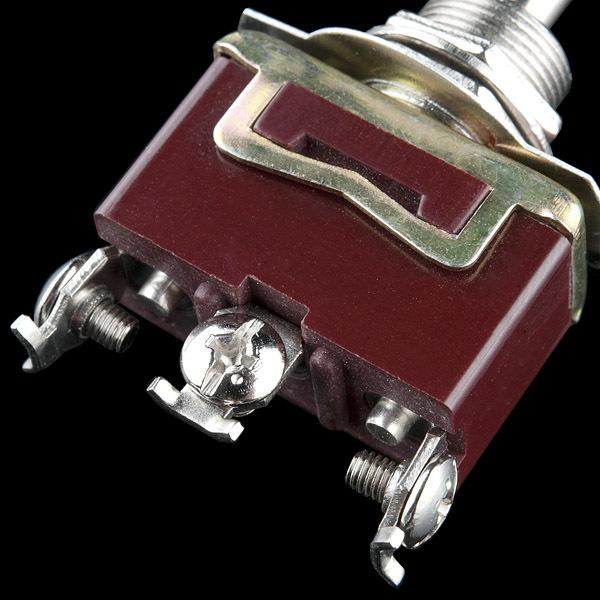 I don't know much about music technology, but I don't think you'd want to use this switch for switching pickups. Holding it in either of the ON positions seems like it would make playing an instrument difficult. If you're doing something where you only want brief samples from the different pickups, though, it could be good for that. Phenomenal addition for my Rally Car. I had spent a lot of time searching for a momentary toggle switch and the only ones that I could find were either a fortune or I would have to buy the whole dash from a former Rally Car that got totaled. Awesome product and has been holding up great.